New Englanders craving for their local signature sandwich, the Lobster Roll, won't have to look past the Golden Arches anymore. Returning to the menu after its year-long hibernation, the McLobster is reappearing at a low, low price (when compared to other Lobster Rolls in New England, that is) of $9. According to New England Today Travel, the North Atlantic lobster meat is frozen when it gets to the restaurant, where it's then thawed and mixed with a bit of mayo and seasonings. It's served on a bed of iceberg lettuce and a long toasted bun, similar to the one McDonald's serves their chicken sandwich on. This isn't the first time the McLobster is making its return to a restaurant near you. The roll first debuted in 1993 nationwide, and it was brought back to New England throughout 2005. Now, it's a summer thing, gracing the McMenu during prime vacation season since 2015. If you've been craving this regional special, you'll have to act fast — the McLobster is a summertime-only sandwich, and it's only available at McDonald's locations in Maine, New Hampshire, Vermont, Rhode Island, Massachusetts and Connecticut. Foodies have taken to social media using the #McLobster to share mixed reviews of this seasonal sandwich. 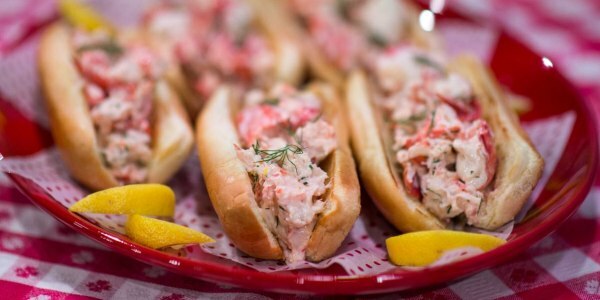 Some say it stands up pretty well, while others think it can't possibly compare to the traditional, yet typically more expensive, lobster rolls of New England. So now we leave it to you: Is the McLobster as good as an old-fashioned lobster roll from New England? It's time to get road trippin' to find out!